That’s where LinkedIn comes in to play. LinkedIn is built on the premise that people will use it to connect with others that they have actually met or worked with in real life. These connections provide real value to each party, since who you know can help open doors to new business ventures, secure new clients, or even help you choose the next employee. This is why it’s so critical to have an updated profile that shows the world who you are and why they need to make a future connection with you. I’m going to impart a personal secret to you; while this might seem nerdy, I get excited by every LinkedIn connection that I make, since I know that it’s only going to help extend my network and make it easier to find more connections. A few months ago I was looking to connect with a person that I had met at a networking event, but I couldn’t find him anywhere on LinkedIn. I asked a coworker to see if they could find this person, and they were able to find and connect with the user, which then opened up a second person connection to me. These types of second or third connections are invaluable, especially when connecting with people not in your immediate network. Participate in relevant industry groups. Sign up for the daily updates to get an idea of what is being talked about in the groups and decide if you have something to add to the conversation. 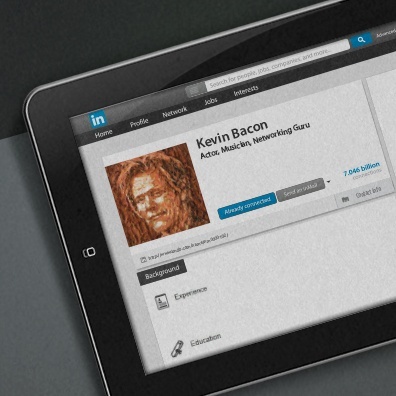 While you may be a solid six degrees away from Kevin Bacon, you are most likely closer to relevant connection from your industry on LinkedIn.